I like this heavyweight duck cloth (canvas) for simple white slipcovers that get a lot of use and frequent washing. It’s a good choice when lighter-weight white fabrics are not dense enough to cover dark colored upholstery. Shrinkage: 3″ on a one yard length, 2″ on the width. This duck is offered in many other colors. White cotton canvas also available in this medium weight 10 oz. White Duck Cloth. A heavy duty canvas made with 2-ply yarns in the fill (width of fabric). It’s denser, thicker and more durable than 10 oz and 12 oz canvas. Designed for tents, awnings, tote bags, etc. but I found it works great for slipcovers. I love the casual, relaxed look after washed….wrinkles and all. Shrinkage: 4″ on a one yard length, 2″ on the width. Slipcover made in #12 weight natural canvas: Kitty’s sectional and Sharon’s sofa. A distressed finish combined with a soft, broken-in feel sets this heavyweight cotton-poly canvas apart from regular canvas. Check out the unique colors. This fabric has been stonewashed, which gives the color an uneven faded appearance. The look is aged, weathered. Washes beautifully, comes out of the dryer supple and barely a wrinkle. Expect 1″ or so shrinkage in both the width and length per yard. 10 oz. Cotton Canvas — Natural, White and Many Colors! I’m very impressed with the quality of this organic cotton canvas. Soft hand-feel, tightly woven and a much lower wrinkle than a conventional 10 oz cotton canvas. Makes a good medium weight slipcover that gets moderate use and a few washes year. This fabric is certified organic by the Eko Sustainable Textile Standard. Expect moderate shrinkage. 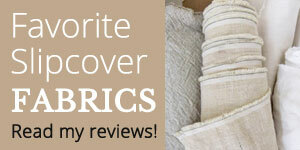 A medium weight Carr-Go canvas for slipcovers that get moderate use and few washes. It’s tightly woven with finer yarns than a utility canvas so the texture is more refined. Hand-feel is peach skin soft. Overall good coverage but check white and natural to make sure your upholstery color doesn’t show through. Shrinkage: 1.5″ on a one yard length and 1/2″ on the width. Slipcovers made in this brushed canvas: Sherry’s sofa and Bonnie’s chair.